It’s the last month of my virtual bee, Bee Happy. Well, the last month for me, anyway. I’m still 4 months behind in my sewing! Talk about guilt! So I’m opting out of next year’s festivities. Kind of a bummer. But who knew I’d go full time at my job, move across the country, buy a house, etc. When we started our bee, it was all local LA Modern Quilt Guild members. Then HALF of us moved to different states, so everyone ended up having to ship their blocks, fabric, etc. each month. Even though that’s how most of the virtual bees operate, that’s not really what everyone signed up for. Anyway, once I get these last few blocks done, I’ll feel a big weight lifted off my shoulders. Still – the bee has been awesome. Make sure to check out our work. Lots of fun ideas! I’m especially in love with Libby’s urban city block idea and her use of the grey herringbone print to be LA’s smoggy skyline. In other sewing news, I’m making my way through a diaper bag. 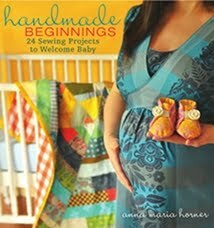 I using Anna Maria Horner’s pattern for the Here We Go Bag from her Handmade Beginnings book. Super cute. So far so easy – pictures coming soon. My sweet aunt and her hubby adopted a perfect little baby boy, and I’m putting together a little package for them: diaper bag, burp cloths, onsies, one of those cute little ribbon tag blankies. I’m saving the quilt for his 1st birthday – I just want to get this package in the mail! One more thing off my plate. I joined a local crafter meet up. It’s been fun getting to know a few new girls in the neighborhood. We’ve all go different skills – knitting, sewing, alterations, repurposing, crochet…very fun mix. We all have different tastes too. It’s a nice mix of fun personalities. I especially like the group leader – she’s a laugh a minute. I’m working on getting a little bit of a life in our new town. Here’s to new friends! In TV news – are you watching American Idol? When Stefano did his sing-off to get into the final 13, I cried. I thought it was just awesome. I am so glad they picked him. I just love this whole season so far. Seriously. Here it is in case you missed it. It makes me want to go to church!